Tuesday 16th June saw Asian Arts Agency kick off our summer season with a very special day of education activity. Working in partnership with Bath Festivals, we produced a fun – packed day of Punjabi song and dance at Writhlington School in Radstock, Bath. Enlisting the services of bhangra maestros 4 x4, we delivered two exciting workshops and a performance. 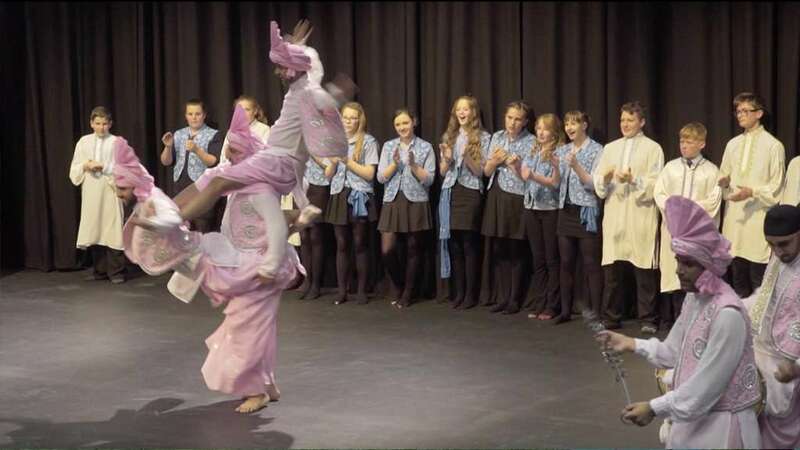 4 x 4 worked with Year 8 students from the school, giving them an insight into the different drums used, the traditional costume, and of course, how to perform those signature bhangra moves! After a well-earned lunch break, the day was rounded off with a special performance from the band in the school theatre. There was plenty of audience participation, with 4 x 4 teaching the audience dance moves. There was even a teacher who volunteered to go onstage and take part, dressed in traditional costume! Finally, students from the workshops joined the band onstage, using props and costumes to create a grand finale finish.